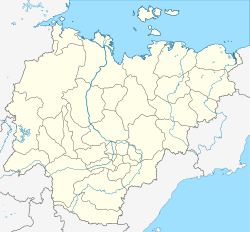 Yakutsk (Roushie: Яку́тск; Sakha: Дьокуускай, pronounced [ɟokuːskaj]) is the caipital ceety o the Sakha Republic, Roushie, locatit aboot 450 kilometers (280 mi) sooth o the Arctic Circle. Population:269,486 (2010 Census); 210,642 (2002 Census); 186,626 (1989 Census). Yakutsk is a major port on the Lena River. It is servit bi Yakutsk Airport as well as the smawer Magan Airport. It is a major suppleer o diamonds. Yakutsk wis foondit as an ostrog (fort) bi Pyotr Beketov in 1632. In 1639, it became the centre o a voyevodstvo. The voivode o Yakutsk swith became the maist important Roushie offeecial in the region an directit expansion tae the east an sooth. Yakutsk didnae grow intae a ceety till the discovery o muckle reserves o gowd an ither minerals in the 1880s an 1890s. Thir reserves wur developed extensively durin industrialization unner Stalin. The rapid growthe o forcit labor camps in Siberie wis an aw a major factor encouragin Yakutsk's development. As an inhabitit locality, Yakutsk is classifeed as the ceety unner republic jurisdiction. Administratively, alang wi the settlement o Zhatay an fower rural localities, it is incorporatit as Yakutsk Ceety o Republic Significance—an admeenistrative unit wi a status equal tae that o the destricts. Municipally, Yakutsk an the fower rural localities are incorporatit as Yakutsk Urban Okrug. The settlement o Zhatay is no a pairt o Yakutsk Urban Okrug an is independently incorporatit as Zhatay Urban Okrug. Yakutsk is a destination o the Lena Heich-gate. The ceety's connection tae the heichgate is anerlie accessible bi ferry in the simmer, or in the deid o winter, directly ower the frozen Lena River, as Yakutsk lees entirely on its wastren bank, an thare is nae brig onywhaur in the Sakha Republic that crosses the Lena. The burn is impassable for lang periods o the year whan it is fou o loose ice, or whan the ice kiver is no sufficiently thick tae support traffeck, or whan the watter level is heich an the river turbulent wi Ware floodin. The heich-gate ends on the eastren bank o Lena in Nizhny Bestyakh (Нижний Бестях), an urban-type settlement o some fower thoosan fowk. Yakutsk is connectit wi Magadan bi the Kolyma Heich-gate. A dual-uise railwey an roadwey brig ower the Lena is scheduled tae be biggit bi 2013, whan the Amur Yakutsk Mainline, the North-Sooth railwey bein extendit frae the Sooth, will feenally connect the ceety wi the East-Wast Baikal Amur Mainline (the railwey haes reached a pynt some 260 km sooth o Yakutsk). The brig will be ower 3-kilometer (1.9 mi) lang an constructit 40 kilometers (25 mi) upriver at Tabaga, whaur the river narraes an daes no creaut a wide floodit aurie in the Ware. In the deid o winter, the frozen Lena maks for a passable heich-gate for ice truckers uisin its channel tae deliver proveesions tae far-flung ootposts. Yakutsk is an aw connectit tae ither pairts o Roushie bi Yakutsk Airport. Yakutsk State University is situatit in the ceety. Thare is an aw a branch o the Roushie Academy o Sciences, which contains, amang ither things, the Institute o Cosmophysical Research, which runs the Yakutsk Extensive Air Shower installation (ane o the mucklest cosmic-ray detector arrays in the warld), an the Permafrost Research Institute developit wi the aim o solvin the serious an costly problems associatit wi construction o biggins on frozen soil. At the primary an seicontary levels, the ceety haes a nummer o UNESCO Associated Schools, includin the Sakha-Turkish College, Sakha-French School, Sakha-Korean School, an School #16. Yakutsk is an aw hame o some theaters an museums sic as Sakha theater an the Mammoth Museum. Mony minin companies hae offices in Yakutsk includin ALROSA, whose diamond mines in Yakutie accoont for aboot 20% o the warld's rough diamond ootput. The airline Yakutia Airlines haes its heid office in the ceety. Wi an extreme subarctic climate (Köppen climate classification Dfd), Yakutsk haes the cauldest winter temperaturs for ony ceety, tho no for ony inhabitit place, on Yird. Average monthly temperaturs range frae +19 °C (66 °F) in Julie tae −40 °C (−40 °F) in Januar, an anerlie Norilsk haes a lawer mean annual temperatur for ony settlement o ower 10,000. The cauldest temperaturs iver recordit on the planet ootside Antarcticae occurred in the basin o the Yana River tae the northeast o Yakutsk. Tho winters are lang an extremely cauld, simmers are warm (tho rather short), wi daily maximum temperaturs occasionally exceedin +32 °C (90 °F), makkin the saisonal temperatur differences for the region amang the greatest in the warld. As the mucklest ceety biggit on continuous permafrost, maist hooses in Yakutsk are biggit on concrete piles. The climate is fair dry, wi maximum precipitation occurrin in the simmer months, the intense Siberie Heich formin aroond the vera cauld continental air durin the winter. Even durin the simmer, precipitation isnae hivy syne the moist sootheasterly winds frae the Paceefic Ocean lose thair moistur ower the coastal muntains weel afore reachin the Lena valley. Wi the Lena River navigable in the simmer, thare various boat cruises affered, includin up the burn tae the Lena Pillars, an dounriver tours that veesit spectacular scenery in the lawer reaches an the Lena delta. Oyuunsky Square. The new building o the Sakha Theater is on the left. Kulakovsky Street at nicht. On the left, the varsity's Sciences Building. ↑ (in Russian). Retrieved 2010-11-10. ↑ Nikolaev, Michael E. (2007-01-07). "The Most Valuable Possession of a Society is Education". Yakutia Today. Retrieved 2009-08-04. ↑ "About Us." Yakutia Airlines. Retrieved on July 18, 2010. "JSC "Air Company Yakutia" Address: 9, Bykovsky st., Yakutsk, Russia, 677014." Russian address: "Contact Us." "ОАО «Авиакомпания «Якутия» Адрес: Республика Саха (Якутия), 677014, г. Якутск, ул. Быковского, 9"
Wikimedia Commons haes media relatit tae Yakutsk. This page wis last eeditit on 8 Mairch 2018, at 05:20.